I like to tune in to talk radio from time to time to see what Rush Limbaugh, Michael Savage, and Neal Boortz have to say about the issues of the day. This was of particular interest in the aftermath of the election, as liberals were jubilant and the mainstream media was consumed with chatter about demographics and a new Democratic coalition: the left won with minorities, women, and white professionals (aka yuppies, because obviously these are three discrete groups), and the coalition on the right (which still made up nearly half the vote) was “too old, too white, too male.” Limbaugh was bound to have a field day with this. When I checked in with Boortz, though, he seemed to be having a rather sober discussion with some kind of scholar or political reporter about the election results. They both appeared to be taking stock of the cold political realities of the vote in a reasonable way, with no sign of hysteria. The famously controversial and combative radio host was engaging with the “reality-based community” that other conservatives dismissed shortly before the election, writing off poll analyst Nate Silver and his mass of data that predicted an Obama win. However, in his next segment Boortz began one of his indelible riffs, and here came the Crazy. He began magnanimously enough. “A lot of this is not Obama’s fault,” Boortz said. “It was the way he was raised.” In Indonesia. He went to Muslim schools. He didn’t learn about American history. He didn’t grow up going to the department store and sitting on Santa Claus’s lap, absorbing the rituals of American Christianity and consumerism. He didn’t go to Fourth of July parades, nor did he see fireworks. He didn’t do all the stuff that makes one an American. Here, Boortz reminded me of the lyrics of a Das Racist track: “We’re not racist, we love white people! Ford trucks, apple pies, bald eagles! Yeah, Cheetos, Doritos, Pringles, Kraft Singles, Slim Jims, Sierra Mist…” Both conflate whiteness with American identity and consumer culture, as if to be an American is to be white, to drive an American-made car, to enjoy “American cheese” that tastes remarkably similar to the plastic it’s wrapped in. Das Racist, at least, may be satirizing a narrow and racialized idea of Americanness, but Boortz is dead in earnest. After Obama’s youthful sojourn in Indonesia, he went to Hawaii. But the Aloha state is not really America; they view themselves as a colony and resent the US. “They love the tourists,” Boortz said, just like they love the welfare payments they receive from the great nation that they despise. (Hawaii, notably, is a majority-minority state, with the largest proportion of Asian population of any state at about 38%.) American history is not taught in Hawaii, which explains why, according to Boortz, Obama did not know how many states there were in the US when he accidentally said “I’ve visited 57 states” in 2008. A constitutional law professor with a degree from Harvard, who served in the US Senate and was running for president, literally did not know there were 50 states. He also pounded on Obama for referring to the US as “a former colony that gained independence” in his victory speech on November 6th. According to Boortz, Obama is unaware that there were 13 colonies, not one colony, because he wasn’t taught American history as a kid. “He is a citizen, not an American. You get the difference?” This was the theme Boortz returned to again and again. The ugliness of this argument needs little explanation, yet it resonates with a deep chord in American politics of recent years. Boortz may be credited with eschewing the nonsense of birtherism—at least he concedes that Obama is technically a citizen, having been born in the US—but he is still speaking the same language. You can be a citizen of this country without really being American—say, if you were born here of undocumented immigrant parents, perhaps you are a citizen but you’re not really one of us. Boortz, no doubt, would argue that his idea of American identity is cultural, not racial. Any kid can go to the mall and see Santa, play baseball, and watch fireworks. But it appears transparently obvious that the authenticity and legitimacy of the first black president has been questioned in an unprecedented way, with the uneasy undercurrent of suspicion that something is not quite right with him in office. He can’t possibly be acceptable for this position. Something is wrong. There appears to be something different or foreign about him that sets him off from all his predecessors. This racist canard has been perpetuated in the fever swamp of the online right, as well as loudly and publicly by rich and (sadly) influential men like Donald Trump. But almost nowhere has it been framed so clearly and potently as by Boortz: “a citizen, not an American.” Who else does this include and exclude? Is my wife not an American because she grew up in Pakistan, became naturalized over a decade ago, and votes for the left? Am I not an American, because I didn’t play baseball or go to church as a kid, and have a Muslim father? Boortz’s riff on American identity might be seen as a reaction to a newer, browner, younger, more diverse electorate, which has been the dominant theme of most press coverage of the election: brown outvotes white, female outvotes male. His perspective, though, recalls something deeper: an uneasy melding of what historian Gary Gerstle has defined as “civic nationalism” and “racial nationalism,” two different ways of thinking about citizenship or membership in the national community that existed uneasily alongside each other in the early twentieth century. For some, America was a “white man’s country,” and the only real Americans were of “native” Anglo stock. The new immigrants from southern and eastern Europe would never be quite American. For others, though, to be American was to cherish the ideals of the Constitution and democracy, which anyone could do irrespective of their skin tone or ancestry. As Gerstle points out in his book American Crucible, both identities were exclusionary: the first obviously was limited by race, but the second also implied that only those who adhered to certain ideological precepts were included. Anarchists or socialists might fail to be properly American, just as Muslims today are viewed by some as possessing a belief system that is antithetical to (American) freedom and democracy. (Hence the charge that Islam is “not a religion,” but rather a radical political agenda.) In this regard, it feels like we have not journeyed so far from the America of Theodore Roosevelt and D.W. Griffith. 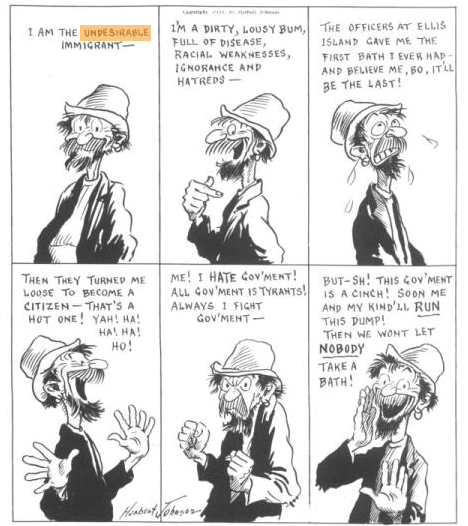 This is not to imply that America is irredeemably racist, or that American identity is inevitably exclusionary—the “new” immigrants of the late nineteenth and early twentieth century were welcomed into the fold of American life in the New Deal era, and those who have come to America since the 1965 Immigration Act have increasingly become accepted as part of the fabric of our society. (See earlier ToM discussions of the changing fortunes of Asian and Arab Americans in US culture.) A man with a strange name and foreign parentage has twice won the White House, with some of the clearest electoral majorities of recent decades. Moreover, we by no means wish to impute a racist or xenophobic cast of mind to all conservatives. No doubt many Republicans refuse to put such narrow boundaries of American citizenship or identity as Neal Boortz did in his rueful and condescending peroration on Obama’s otherness. Many Americans on the right wish the best for the country and want to move forward in good faith, regardless of their disagreements with Obama on taxes, foreign policy, or other issues. Still, it is hard to overlook the facts. Boortz and his friend Limbaugh command massive audiences, with the latter the long-time leader in radio with as many as 15 million weekly listeners. There are a fair number of people who listen when Boortz says that Obama is not really one of us, and it’s probably safe to assume most of them are among the 58 million Americans who voted for Mitt Romney. A June 2012 Dartmouth poll found that more than 60% of Republicans believe Obama was not born in the US, despite all evidence to the contrary. (About the same percent still believe Iraq had WMDs.) For them, it is hard to make sense of how a pretender to the throne—someone fundamentally unqualified for the position, by dint of birth, ideology, and intellect—somehow managed to stay in the White House. It’s a changing country. The demographics are changing. It’s not a traditional America any more. And there are 50% of the voting public who want stuff. They want things. And who is going to give them things? President Obama. 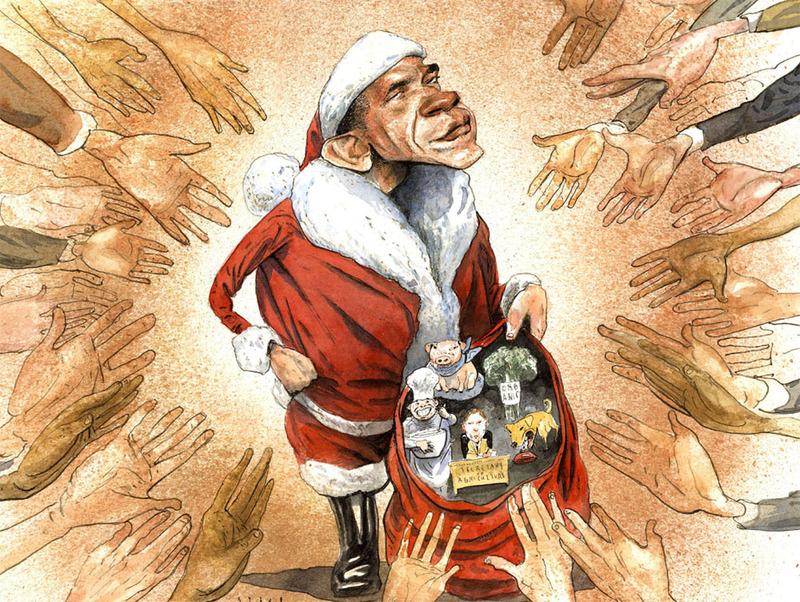 So we’re back to Obama and Santa Claus.